He speaks of the secret life of the self in colours that conceal nothing. Art is more eloquent than a diary. Paint is more personal than language. Hodgkin’s ability to alarm colours by introducing them to one another makes his paintings uniquely fresh and unsettled: it is hard to imagine them ever going stale. They are exciting in the way that rain on a leaf in the morning light is exciting. Hodgkin paints in that British tradition going back to Thomas Gainsborough of aliveness to the colours of nature. “Richard Cork hails a ‘hugely enjoyable’ exhibition of paintings by one of Britain’s foremost living artists, Howard Hodgkin. Modern painting is usually expected to be fast, impulsive and unstoppable. Spurning the prolonged gestation period associated with the art of the past, contemporary painters are supposed to stake everything on spontaneity. The norm, as so often, was established by Picasso, who in later life thought nothing of producing several large canvases a week. The myth of the artist as human cornucopia, letting images well up in the subconscious and spill out incessantly onto the picture-surface, retains its potency intact. With typical obstinacy, Howard Hodgkin resists this cliché at every turn. Far from rejoicing in a prolific output, he produces sparingly. His latest, hugely enjoyable exhibition at the Anthony d’Offay Gallery is his first one-man show in London for five years. Many of the paintings are surprisingly small by the overblown standards of today. And several were begun almost a decade ago. The danger with such along germination is that the finished image could look laboured. Ever since the Pre-Raphaelites, the most Puritan English painters have doted on dogged execution, regarding slowness and pettifogging care as a moral virtue. But Hodgkin has a healthy horror of plodding art. Although his Lovers took an epic eight years to complete, it looks as if he carried it out in a single, blithely sustained bout of work. Among the largest and most commanding pictures in view, this eruptive image seems to have been made with dashing assurance. The swathes of orange and green pigment curving across the panel are so irresponsible that the y burst out of the frame. Their impact is orgiastic, and yet Hodgkin contrasts their glistening impasto with an undulating area handled in the thinnest manner imaginable. Reminiscent of naked flesh, at once glowing and vulnerable, this passage seems in places hardly touched by the brush. Bare wood plays as much of a pictorial role here ash the white canvas in a late Cezanne. Elsewhere, though, Hodgkin makes no attempt to disguise the layers lurking beneath the final application of paint. In The last time I saw Paris, a band of grey frames the scintillating radiance of the central image. But gaudy dots of scarlet or orange can be detected underneath this subdued border. Only at a late stage did Hodgkin decide to rid his picture of this festive edge, and we can still sense some of the conflict which led to the eventual act of alteration. Diagonal ridges of overlaid pigment area likewise visible in the central part of the work, frankly at variance with the paint-flow applied on top of them. The contrast between these two states adds tension, accentuating the vivacity with which Hodgkin transforms his images. An infectious excitement with the act of painting is always conveyed, alongside a willingness to take risks rather than settle for the drab caution which English art so often relies on. The outcome is consistently exuberant. Although London-born, and a student in the late 1940s at the notoriously restrained Camberwell School of Art, Hodgkin has fought against Anglo-Saxon reticence throughout his career. In one of the quotations which he’s has chosen to preface the handsome d’Offay catalogue, Anita Brookner describes the ‘happy few’ who ‘remain emotionally alive, who never compromise, who never succumb to cynicism or the routines of the second-hand’. 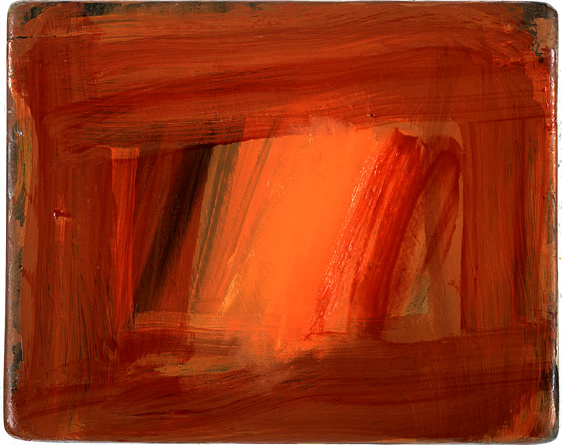 Now over 60, Hodgkin clearly aims at resisting the tendency of so many senior artists to settle for an easy formula. And on the evidence of this engrossing exhibition, he has succeeded with aplomb. Far from lapsing into repetition, and numbing the viewer with predictable solutions, these sprightly paintings are still able to challenge and provoke. They are the work of a man vigorously caught up as ever in the endlessly fascinating attempt to define the essence of his memories. Another quotation in the catalogue is drawn from this friend Bruce Chatwin, lamenting the fact that nothing can ‘bring back the things we loves’. It is a passionate, elegiac passage, terminating in the bleak belief that we cannot recover ‘the smell of the beanfields; the sweet, resinous smell of deodar wood burning, or the whiff of a snow leopard at 14,000 feet. Never. Never. Never.’ All the same, the charged and sensuous power of Chatwin’s prose offers a remarkable persuasive evocation of the experiences he has cherished. The same can be said, in visual terms, of Hodgkin’s own art. He strives, each time, to arrive at an image which does justice to his rapt recollection of a place, person or event without resorting to literal representation. Sometimes, we can feel fairly confident about identifying a particular form within a painting. A round limp of pigment suspended like a blood-clot in Venice sunset can only be the flaring orb itself, descending towards the lagoon. More often, though, the work defies such interpretation. Patrick in Italy may refer to a memory of his fellow artist Caulfield on holiday, but the painting refuses to yield up its secrets. This entry was posted in Uncategorized and tagged Howard Hodgkin, painting from memory. Bookmark the permalink.